Hey hey, what's going on ADPI? How are you doing? Mike foster here and today's going to be a little more of a mindset episode. We’re really going to take it back and I want to talk about what, really it is that you're working towards. You know this kind of goes hand-in-hand with your why right and trying to figure out why it is you're doing what you're doing. So both of those questions really the same. But you need to understand what it is you're working towards and you know how long you're going to take to get there right. Goal-setting generally. if you are listening to this right you are either just starting out or you know maybe a little bit about real estate and you want to know more, you want to see what opportunities it can open up for you and I'm here to tell you that there are a lot of opportunities that it can open up in your life. But that is both a blessing and a curse. Because with a lot of options comes a lot of paths and a lot of paths comes to a lot of confusion and if there is a lot of confusion, sometimes it will overwhelm you and the last thing you want to do is to be overwhelmed by all the many avenues you can take real estate in to the point where it is a detriment right. Because let's face it, I mean you can be a jack-of-all-trades. You can do a little bit of everything and you can be successful at it. All right I've seen people who have done it right and it is okay. But thing is that if you don't know where you're going, then the tendency for you to fall down the wrong path and make the wrong choices in real estate is a lot more possible we'll say and that's not something that I wish for any of you guys. So let's take today and really go back to some of the basics. When I got started I read Rich Dad Poor Dad. Now I had no idea that I was going to get started down the rabbit whole real estate when I picked this book up. But it was a book that was recommended to me multiple times by a few different people and so I said you know hey what the hell. I downloaded the audiobook and every day a little bit by little bit I listened to more of it on my way to and from work and it changed my life. It really did. It opened my eyes to a whole lot more than just, real estate. Although that was definitely one of the big topics that were discussed. But it was understanding the flow of money. Understanding how assets and liabilities played into each other right. Understanding the power of cash flow and how that was a better investing method than you know looking and waiting for appreciation. I mean sometimes it can take a long time for you know for companies or for the real estate market or whatever to blow up in your favor right. I mean compound interest is great especially when you're getting a good interest rate. but even still let's say even if you're getting a 10% return, it's still going to take time for that 10% to eventually accumulate into something that you know will benefit you greater in the long run all right. Like all investments, all investments are made for the tomorrow not the now and so it's important that we know what we're working towards for that tomorrow. So that way when we get there we'll know we'll be able to adjust and plan accordingly for the next tomorrow right. So, for instance, are you looking to work for the rest of your life? Answer that question you know and if you are that is quite okay and there's nothing wrong with that. But if you're not then what is going to be that point that sends you home? Right, that tells you it's time to hang up the Cape you know. If you want to work for the rest of your life you found a job that you're comfortable working in and this is a good fit for you and you want to keep working there until you're told to leave or you know whatever that's fine, there's nothing wrong with that and you know what all the more power to you. I honestly I envy people who have found their passion earlier in life. Because that is good right. That to me is fulfilling. My fulfilment comes from living my passions every single day right and I've got quite a few. But you know if you find yourself working towards something that you love and it makes you money and it makes you enough money that you're satisfied, then you are a very blessed person in that regard and it's definitely something you should continue to do. But you know for me even that I don't plan on working the rest of my life. You know I do plan on retiring early. My goal is to retire in the next, oh wow it's going to be almost eight years here in September. You know what I mean. I set that goal out for myself two years ago ten years and now Here I am rounding the corner and going on, eight left and I'm hoping that you know before then I will have achieved that you know that wealth or that cash flow enough that will set me back. But I understand now you know having been educated that the point that I retire will be at the point where my expenses are, I guess handled will say right by the passive income that I have coming in. right so when I no longer need to work actively to sustain an income that will satisfy my desired style of living, I will know at that point it is time to hang up the Cape and it's not that I don't want to work or to do something for the rest of my life. It’s that I don't want to rely on that w-2. All right I don't want to rely on that stated income as you file every tax here knowing that you have to go to that nine-to-five or that six to six right. Because really in the military you know we're up at dark and we're getting home at dark. So it's not really, it's not really 9:00 to 5:00 for us. But you know what I mean. So that's my goal. Those are my goals in life and whatever I decide to go into afterwards will be in line with one of my passions or maybe all of my passions right. If I can somehow live or start either a business or make investments that involve all my passions, it's great and that will be me of my ultimate you know I've right at the top of my game. So you know but that is what I will look for. That is my benchmark right. When my expenses are handled by my passive income. That is my benchmark or I say okay like it's time to move on and it's time to do something else. All right so that is that's essentially what you want to look for. You know and just an example your goals may be different right. You may see your achievement when you've bought the car of your dreams or maybe when you've either built or bought the house of your dreams right or you know you feel like you're able to now move to another country and as an expat there. Whatever, alright whatever your dream is, whatever your goals are to make sure they're clear, make sure they're defined and make sure that you understand what it is you're working towards? So when you get there you have a good idea in mind. So after I got started with Rich Dad Poor Dad, my education really got collated by a man named Clayton Morris. I'm not sure how many of you are familiar with him. He was a news anchor for Fox &amp; Friends. He owns and runs a turnkey real estate business right. For those of you don't know what that is turnkey real estate business is a company that goes out finds properties that need rehab, that need work done to it and so they do it right. They fix that home and instead of flipping it. They put tenants in them. Right they rent them out they find property management. So they're already starting to cash flow and investors can come and buy those properties from that company. That way they don't have to do the work of finding tenants, of fixing properties, finding properties. All those deals are already ready-made in a package ready to sell off to the investor. 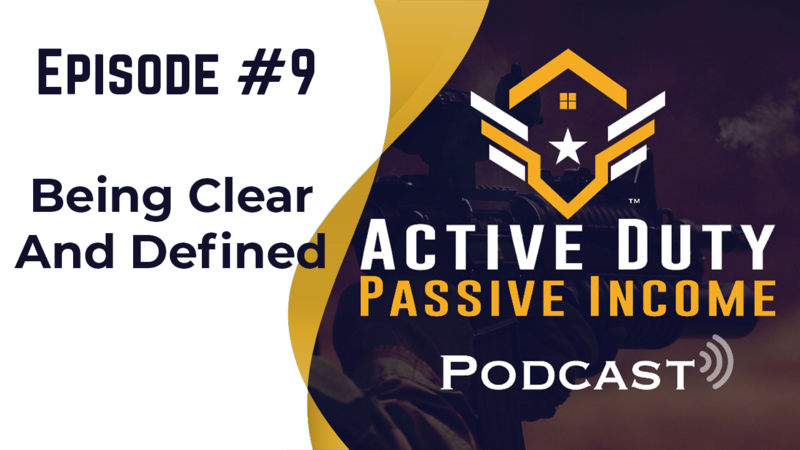 Right so he simplifies the investment process and we work with a few turnkey companies as well here at active duty passive income. So if that's something you're interested in you definitely can find that through us and right and you get access to that by of course you know buying into our course and you know getting the mentorship piece that we have through start the spark. But anyway so he has one of these companies and he also has a successful podcast. Which you know teaches people how to invest and I am one of his you know pupils. I'm one of the people that learned a lot from him. continuing on in this you know mentality that he needed to work to make ends meet, he had to reflect and let go of that fear. All right that innate fear that we all have before making a huge change in our lives. You know maybe you're listening to this podcast right now and you realize that you are at the position where you don't have to work anymore to achieve an income that's sustainable for your family. Maybe you already have investments or business or whatever right that is coming in that is enough for you. Well if you are at that point then I highly encourage you to reflect again and figure out what it is that you want to accomplish in life you know and take some time and live those passions out. You know you don't have to work until you are old and grey and unfortunately we live in an age where there are some people that do. Because of you know investments that made in the past that went south. more important that we educate ourselves to the point where we can you know include those safety nets in multiple facets in our lives right. Diversify the investments that we make. Understand what goals we are heading towards so that way we can, you know when we get there we know okay we've made it maybe before we get there we can you know push back, to create another goal. Right you know you're about to accomplish something, set something else. Continue to work for something don't get stagnant right, don't be comfortable. You know if you're if you're investing in your 401k don't be comfortable just investing in that right and I say all this to say that you know this was a lot of what I learned just listening through Clayton Morris in his podcast. He is a huge mentor of mine. Him and his wife Natalie, if you don't know them make sure you go check them out. I've got a link to both their podcast and a little concept I'm going to introduce to you guys here soon. But they are an amazing couple and they invest with their family. They teach you everything about you know what it is with real estate investments, how you can take advantage of tax benefits and all this. I mean obviously, you know they're geared more towards civilians alright. So they teach everybody. But it's not something that you can't do. You know I learned it so many other people have learned it and taken those nuggets and you know and gone. You know our platform is that we tailor all our information towards military, but there is a lot of stuff that you're going to run both sides of the coin. I mean with the exception of our benefits. Right, that helped us invest in real estate. A lot of these concepts are still the same and they apply to everyone. So the knowledge is you can gain from going to other sources is great. So when the people that we bring upon our interviews or that we, you know partner with, we encourage you please reach out to other sources. Make sure that you get all the information that's out there that is free to share. Because there is so much you know that you can take advantage of all right and so Clayton Morris he has an amazing concept and it's so simple right. properties will help you get to that point. Now the reason this is important is because a lot of people think that you have to be this real estate tycoon. You have to be a Donald Trump in order to be financially free with real estate and that is not the case. That’s not the case at all. As a matter of fact you would be surprised to know how many properties would get you to the point where you can feel comfortable enough to step away from your 9 to 5 right or sorry to step away from our you know our dark to dark right and hang up the uniform and say you know what I'm okay or you know you don't decide to hang up the uniform. You decided to continue service. but you know that when you do you are okay and you're no longer bound to that spell that so many of us fall into where we feel like at ten years I might as well finish out the rest of the ten years, I'm not happy. I'm not happy in the place that I am what I'm doing. But I'll stick it out because I feel like I have to in order to get that retirement benefit and then I'll be okay or maybe it's not ten years, maybe it's fifteen years and maybe you've just had you know a bunch of really bad tours just back to back to back and you're tired of dealing with this and you're tired of putting up with the same nonsense. But you're going to continue it anyway you know and I'm not saying that that is a bad thing to sacrifice yourself for service. That is 100 percent noble if that's your intention. But again and being honest ask yourself, is that really your intention or are your intentions a little more selfish than that. Again be honest with yourself and then there's nothing wrong with it. Admit it and accept it to yourself that you know if you are sticking around because you feel trapped and you feel like the only way you can liberate yourself is by accomplishing the twenty, getting that retirement benefit and then moving on to whatever else, then you're looking at life wrong and you should really question whether or not staying in that uniform is helping you, helping your family or helping the sailors, Marines and soldiers that you lead right. The Airmen that are in charge of you. If your financial life is impacting your leadership or your work ability into you know to work side-by-side with your peers right, then there needs to be some self-reflection there and you need to say am I doing this right or am I doing this wrong. Is there a better way and if this is what you're coming up with, then yes I'm here to tell you there are so many better ways. But you have to find them. In this information age that we live in its easy, you just have to ask the questions and nowadays you can ask these questions on Google and you'll come up with thousands and thousands of results on people who are posting things that they have found in life. Things that they have done. Other ways that maybe interest you if real estate is not your game. I don't know why you're listening to a real estate investing podcast. But if real estate is not your thing that's fine. There are so many other avenues out there for you to accomplish, that financial freedom you're looking for. But you have to be hungry and you have to go out and search for it and you can't get complacent okay, you can't. So just keep looking right and find something, don't give up okay. So I want to go over this freedom number. Because I think this is really important for those of you who are listening to really understand and to just put into practice you know again this is Clayton Morris his freedom number is not mine and it's awesome and I'm going to share it with you anyway. Right, it's a little free plug for him and like I said I've got some, I got a link and you know his page posted in our show notes. So make sure you checked it out after this but. All right so with your freedom number. All right so you know just a quick background. He invests in properties out in the Midwest. I believe in the same thing right. Because why work harder when you can work smarter and buy properties that are ten times cheaper than they are out on the coasts right. Like California first for instance where the average three-bedroom two-bath is probably in the 500-600 and 700 thousand dollar range depending on where you're investing right. Whereas in the Midway in, Indiana in Michigan in Mississippi right; you are investing in maybe three bedrooms, two baths that cost less than 60 grand you know what I mean. It’s crazy but that is what is out there and you know if you don't believe me, go take a look on Zillow and see for yourself. I mean there are properties out in the Midwest Tennessee right, all these properties out there that are so much less than what they are on the coastlines. So just go ahead and check it out anyway. So he uses you know there's Midwest properties as the marker and says okay for an average property that costs let's say $50,000 right. $50,000 this property is going to you know cash flow somewhere around 700 to 800 or I'm sorry it's going to rent for about 700 to 800 dollars okay. Not cash flow, it’s the rent. Okay, so there's a difference. Now that is the rent that's coming in each month that's what you can expect. That’s pretty good. Especially if your property causes $50,000 your profit margin there is looking pretty good. Now you always want to add in a buffer for expenses. Let’s say you experience a 40% loss. Alright that's super conservative and you know that's not something you'll really see, but that's fine right. You want to account for every possible expense. So you multiply nine thousand five point six right, that's a 40% loss and you come up with 5,400 okay. That is how much you're going to make the end of the year okay. So the 5400 at the end of the year, again we'll divide that by 12 and we see we're going to make four hundred and fifty dollars a month okay. So with each property you want to say that you're going to make about four hundred and fifty dollars each month in cash flow and that's your net right. That’s your net cash flow. This is just accounting a 40% loss of your income due to all your expenses. Whether it be maintenance, repairs, right property management you name it, insurance all that stuff. All right you want to account for that. Okay so now let's figure out what we need to set ourselves free. Okay so if you are looking at your expenses and you're seeing that your average expenses are let's say five thousand a month. Okay, let's just be generous and say your average expenses for yourself or for your family right its five thousand dollars a month. It may be it more maybe less but we're going to go with this ballpark figure okay. Now if five thousand dollars a month is you know the average lifestyle that you're living and you want to you know invest so you can have a little bit of a better lifestyle, then give yourself a little more of a cushion. Right, give yourself an extra $500 a month all right. An extra $500 a month even if you're putting that away is six thousand dollars at the end of the year. That’s enough for you to take a nice trip at least once a year with your family or maybe if it's just you and your wife or if it's just you know you by yourself. to find. Okay so you're going to take those five thousand five hundred dollars and you're going to divide it by the 450 that you solved in that cash flow for that property. Right, how many properties are you left with? If you've been doing the math with me you can see that 12.2 right is the answer you get. Obviously, you don't have a point two unless maybe you're you know doing something crazy with your property. So let's round up to an even whole number right and we'll go with 13. Well, there you go 13 properties guys is what you need. 13 of those Midwest right $50,000 properties is what you need to set yourself up for success for the lifestyle that you want to live. That's it guys and it's so much different than the 50 or the hundred or the thousand right that you see some of these big real estate moguls have right. But that's fine, that's what they love to do. They love to buy properties, they love to make you know money and that's and that is what it is right. But if you're not that type of person. If you just want to have enough to live a nice lifestyle for a new family. Maybe you want to have a little more to save up for random losses that you may incur, that's fine and you can do this without having to leave your job right. Without having to delete the military. If you're comfortable where you are and you want to get started you can do this. All right you can save up money to go buy on one house and you can use the money that's in that house to roll in on buying another one. There are so many strategies out there but you guys just have to you know do some digging and understand. Stick with us right, stick with active duty passive income. 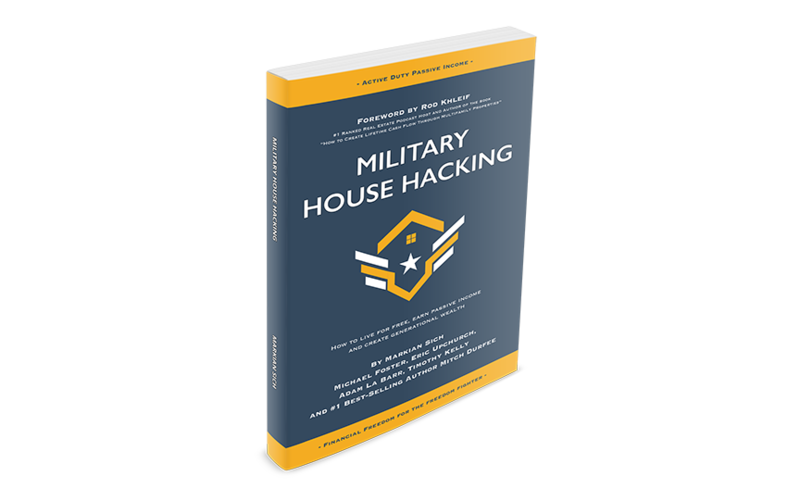 Subscribe to our channel we will show you all this, all the awesome strategies that are out there and how you military family can kill it. Can absolutely crush it with the benefits that are afforded to you. But stuff is there. 13 properties guys in this example and if your expenses are a lot less than 5500, then hey you know you've got a lot less. If it's a little more okay fine you've got more. But again right these strategies out there alright and this method is an amazing tool and it's something that I want to share with you. Because I think it's powerful and this method is what got me into being really motivated to doing and to see how possible it really is. That it's not impossible for me, a city boy from New York right growing up lower income family alright. A little lower middle class right. Lower middle class, bottom right not ever being afforded any information like this out there and now I'm in an age where I can access it and I'm hungry for it and I found it and I'm motivated to get it. Alright, so here it's possible. 13 properties guys that's not that hard. When I did it back then my freedom numbers 15 and with life and how it’s moved, it changed to 20 and I set that goal you know again two years ago. 20 properties are what it’s going to take for me. I want to have $10,000 and passive income coming in each month for me to live the lifestyle that I want to live. That is my goal and it's clear, it's defined. I'm going to get there in less than 10 years. but I've got 10 years to do it and you know it's awesome and I'm going for it and I'm almost there. You know so well almost relatively right. You know I'm starting out. But I've got six properties right now. So I think I'm well on my way. I think that's fair to say right. So who ayah. Now another reason I want to bring this up is that Mark Yancey right, our CEO; he has developed an app that can not only cow collate this freedom number for you. But it will show it to you and you can have it every single day in your pocket or in your hand. You can show your spouse, you can show your partner, you can show whoever your friends your family that a is the journey that I'm on and this is what I'm going to do. Okay so in order to find this app and again it's absolutely free okay. You got to go to iTunes right if you have it and actually as I'm mentioning this now, sadly it is only for iTunes right now. So don't beat me up I'm sorry if you're listening does this on Android, we are you know hurrying to get it available to all other platforms. But as of right now it is only available for iTunes. But hey you know if you got a buddy that has an iPhone maybe you can borrow theirs for a little bit just so you can see it. But a so you're going to go to iTunes your look up the military real estate investment calculator. Okay, a cash flow calculator and you're going to go in and see it. Alright, you can see our little logo alright and then your download it. Now once you get there it's going to take you through a couple different windows and this is going to be your calculation data okay. So the first thing you're going to see when you get there is the amount that you have saved up. So you're going to enter the amount of money that you have saved up. Let’s say you know, let’s say you're starting from scratch. Let’s say you saved absolutely zero right. Now you can never go ahead and you're going to put that zero and you're Going to move on to the next one and the next one is going to save how much do you save monthly? So the first one was how much do you have in your savings account the next one is how much do you save monthly so let's say you save you know two hundred dollars a month. Okay, you're starting your savings right now and you're saying to yourself okay I'm going to start by saving $200 every sitting month right good to go. now the average property price now this is going to depend on the type of investor you are and this is why I say that with a strategic approach to investing and making sure that your numbers are the same, you're not going to fluctuate or you want to be very clear you're going to be very defined in your goals and what you're working towards and how you're going to get there. Okay, you don't want to you know to buy a hundred thousand dollar property here, four hundred thousand dollar property here, a thirty thousand dollar property here right. All that fluctuation may take you off your path and it's going to be harder for you to accomplish that goal in the time that you set for yourself because you're going to be all over the place okay. So you want to be very clear and defined and strategic in how you invest. So just like we did in our example, I'm going to put fifty thousand dollars because that is the average price of a property that you would find in the Midwest all right, a good rental with a solid return. So you save that and then your next window is down payment. Now for us right from military, if you're still in chances are you don't have hundreds of thousands of dollars saved up or you can just drop cash on properties and buy them free and clear okay and if you're younger you definitely don't have this much money. You don't even have this much money saved up in your 401 K, sorry your TSP right. So fine and is okay we expect you're going to pay a down payment. Now understand that for investment properties the average down payment is twenty percent okay. So if you're thinking that you're going to do 10 percent then hey that's more for a personal property and understand that might not be what you're doing. but if you're a creative investor and you found creative ways to acquire properties and you've let's say or let's say you've been listening to, I'm sorry not listening you bought into our course right and you learned all the different creative ways out there that you can buy property and you're setting this goal that 10% is what you're going to use to buy your properties with, hey more power to you. But go with what you are going to you know go for it and again strategic right. You don't want these numbers to change as much. So you want to go in without understanding. I am going to put $20,000, sorry 20% for this example and that's going to bring you to ten thousand dollars each month. So what that's going to do is right and you're going to see every time you reach that ten thousand marks, you're going to go under find a property and you're going to buy it. Okay so bear with me. So that after you save that down payment window, the next question is going to ask you is your estimated interest rate. How much do you think you're going to pay an interest? Now obviously this depends a lot on your credit score. If you have bad credit make sure you go it and you check up our YouTube page. I did a video on how you can build up your credit in a very quick amount of time right. Definitely, want to make sure that you understand that. Because that's going to help you out all right slash is another tool. But the average right Fed rate right now is between four and five percent. So maybe for sake of argument, it's good to go higher on this one. That way if something is lower than the numbers work out more in your favor and you're good to go. Okay, so we're going to go for five percent in this example. Okay, now the next window you're going to see is your average rent. The average rent that you're going to expect in these properties that you buy. Right now well we will go with the average rent that we went for in the last example which was 750. Because that's what you're going to see in this market. But again this may change. So have an idea of the market that you're going to invest in. What the price of properties are and the amount of money if you're going to get in rent each month. Okay, so you don't want to save that. Now the next thing you're going to get is the estimated property expenses. Now you want to include taxes, insurance, property management right. Capital expenditures let's say if you're doing something a little more commercial. Maintenance, vacancies; you want to include all that. But what you don't want to include is the principal and the interest that you're going to pay and your mortgage okay. We have already handled that calculation for you. So you’re principal and interest payments will be included in that. What you want to estimate is the amount it's going to cost for the rest of your expenses. Right your tax your insurance, your property management, maintenance all that jazz and what you can do is if you'd like to go in and you know to take the difference between that forty percent right and then throw it into there and use that for your expenses. Now it might be a little more than the forty percent in this regard. Because you're taking out a loan. Right now Clayton's the rule really takes into account if you're buying those properties cash. You’re not buying the property cash here. So you'll likely see more of a 60% loss due to the fact that you're paying a mortgage on this property okay. So maybe you want to do that, that's usually what I do if I'm using Clayton's rule and on a certain property. I'm investing in I'll go at a sixty percent. Just because I know I'm going to lose a little more because of the mortgage that I'm using right. So okay so do the difference in those numbers, add the rest for the expenses and then maybe good to go right. Now your estimated appreciation rate. Now, this is the next window you're going to get all right. Estimated appreciation rate. This is something that you can add, this is something you don't have to add typically I don't and the reason that I don't is because I don't invest for appreciation, I don't count on it. Appreciation to me is icing on the cake. the reason why it's included in this app is because two of the numbers you are to see is the amount of equity that you have from your portfolio and the amount of cash flow that you've built coming in each month. So you're going to see both those numbers and that's why the appreciation rates in here. But I don't typically add it. Because again I don't count on it. is going to be a start the last question you're going to get is a start date right. So we're going to start today. Okay, today we'll say August first right. We’ll project a little bit. So August first we're going to start there and we're going to check out our graph. So it takes you to now a graph page and it shows you okay so you are starting out with zero dollars in equity with two hundred a month in cash flow. Because it's considering the 200 a month that you have in savings as part of your cash flow right and it will continue to do that. So as you see that graph up there on the top, you're going to take your finger and you're going to swipe and as you swipe you'll notice that you're going to feel your phone vibrate and it's going to show you coins going up. Because each of those vibrations is a point where you will have bought your next property and as you swipe across you'll see that the cash flow you build starts to grow. By the more properties you have and with more properties you have, the faster it takes for you to get to that 10,000 mark that you set as your down payment for each of the properties you're going to buy. So again like I said with a very strategic method of investing, your financial freedom can get here a lot quicker than you think. Now let's say for argument's sake right that $5,500 mark was what we were looking for. I can see here that after scrolling my finger across February of 2034 is when we will have achieved it in this scenario right. Now that's great, that's great, that's not too far off you know. With a very conservative approach to investing you can get there and with the 5500 you built in passive income you've also built three hundred and fifty-eight thousand dollars in equity. That is huge. Because again as you continue to learn you can do a lot of money, a lot of damage with that money that you have built up in equity right by leveraging the equity to buy more properties. Right, so you can achieve this goal a lot faster than February of thirty-four. It is very possible for you to achieve financial freedom relatively quickly. But it always comes from hard work and it always comes faster with efficient work. You don't want to be all over the place when you're investing. You want to make sure that you're very clear, you are strategic, you’re systematic and you're defined and it all goes into that question that I asked at the beginning. What is it that you're working for right? What are your goals? If you have those goals or what you're working towards in mind, you will be able to be clearer on the type of investments that you want to make. All right, guys, that's really it. That’s all I've got. Thank you so much for listening it has been an absolute pleasure. I absolutely love this. I can't tell you how much I love this. Because I really think it's hard to define but I love sharing these things with you guys because it's important. Because it's stuff that I did not grow up with, they don't teach us this in school. But now this information is out here and it's so readily available. It’s awesome so I want to make sure that you guys have what you need to succeed in real estate. Okay, we want to make sure that you have what you need. My team is ready to help you if you are ready to begin okay. www.activedutypassiveincome.com, go check it out. Connect with us on Facebook, connect with us on Instagram. Right, continue listening to this podcast. Go ahead and subscribe if you haven't subscribed yet. this is going to be a life-changing tool and we are going to make sure that we are bringing so much value to your, to your car, to your ears, your phone. whatever that you're listening to this podcast in whatever that you use to surf the internet at home or at work right when you're not supposed to or you know if you're just waiting around right. We are here to help you and thank you so much listening guys. Appreciate it again Mike Foster.